As the seasons continue to turn and the temperature continues to fall, new car buyers in wintry climates are increasingly faced with a weather-based problem: what does my new vehicle need to keep me safe and in control driving through the snow and slush? Luckily, there are numerous features that can improve a vehicle’s winter performance, which are available at various price ranges across a number of different brands. Vehicles that offer the strongest winter performance generally share one common adaptation: all-wheel or four-wheel drive. These systems offer better traction in slippery conditions like snow-covered roads by redistributing the vehicle’s power to the wheels that need it the most. For this reason, some publications like U.S. News & World Report and Autobytel recommend the Subaru Impreza. 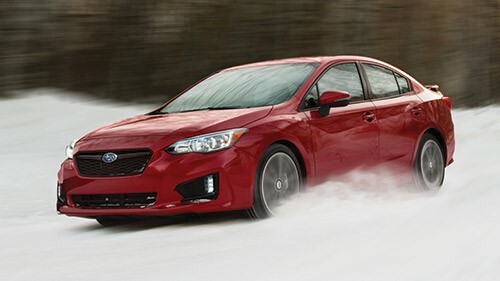 A compact car in a list full of SUVs, the Impreza stands out because the brand’s pervasive all-wheel drive system gives it an edge in the slush without the expense of buying a bigger vehicle. If driving in deeper snow, you’ll need a more substantial vehicle. A compact car is more likely to get stuck, and all-wheel drive can’t prevent that. Therefore, most publications suggest that new car buyers choose crossovers or SUVs to stand above the snow. One particular option offered by both U.S. News & World Report and Forbes is the Mazda CX-5. Forbes in particular notes that in the refreshed version, the CX-5 can reach ground clearance of up to 8.5 inches, although Mazda notes on its website that the CX-5, at its lowest, offers a minimum 7.6 inches of ground clearance. Another strong consideration when choosing a vehicle adapted to winter conditions is whether its interior includes features that will keep the driver comfortable while on the road, in addition to whatever traction it can provide. These kinds of features are particularly prevalent in premium and luxury models. For example, U.S. News & World Report suggests the Cadillac CTS for its heated steering wheel and heated rear seats in higher trim levels, or the Mercedes-Benz S-Class for its Warmth & Comfort package that adds a heated steering wheel and heated and ventilated rear seats. These features are by no means limited to high-priced models. The cost-conscious Mitsubishi Outlander, suggested by both Forbes and Autobytel, offers the all-important heated seats in most of its trim levels, and can be equipped with more winter-weather adaptations like a heated steering wheel and windshield wiper de-icer. Finally, a strong consideration when deciding on a good winter-weather vehicle is the strength of its safety systems. After all, an all-wheel drive system won’t always prevent slipping, and heated seats certainly don’t protect against collisions with other drivers. Strong safety features are available in a wide variety of vehicles. One option offered by Autobytel is the Volvo XC90. This SUV was a 2017 Top Safety Pick from the Insurance Institute of Highway Safety (IIHS), meaning it performed extremely well in crash tests and offered strong crash prevention systems. More specifically, the XC90 offers front and rear collision warnings, side blind zone alerts and a run-off road protection system. With a simple checklist of all-wheel or four-wheel drive, tall ground clearance, cold-mitigating interior features and strong safety ratings, you can find a number of vehicles to offer good winter driving performance during the coldest months of the year.